alternately titled- life for the last 9 months. or the summer at the least. 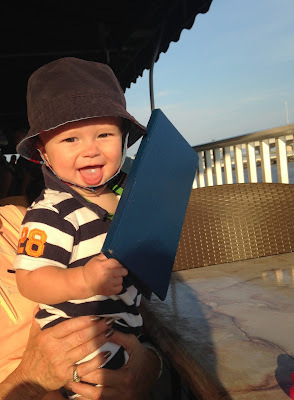 Today is Carter's first day of school (separate post on that, because duh- blogger mom.) I have high hopes for these sacred few hours each week with only 1 kid! Goal #4- a little Hoda and KLG time- I plead with you Reid- give momma a nice long nap to catch up with the ladies! And if he would just sleep through the night, I'd appreciate that too. My mom and I took the boys to the beach last week and that boy just doesn't want to sleep there. too much fun on the bay- why sleep?! Summer was bomb. It was the summer of fun. Because what else can you do with a 3 year old and a baby? Anything productive had no chance of getting done- so fun it was! Parks and play dates, donuts and ice cream, baseball and tricycle and walkers and beach trips and trips to rides and mini golf and the water park. Carter loved swimming at any chance we got! 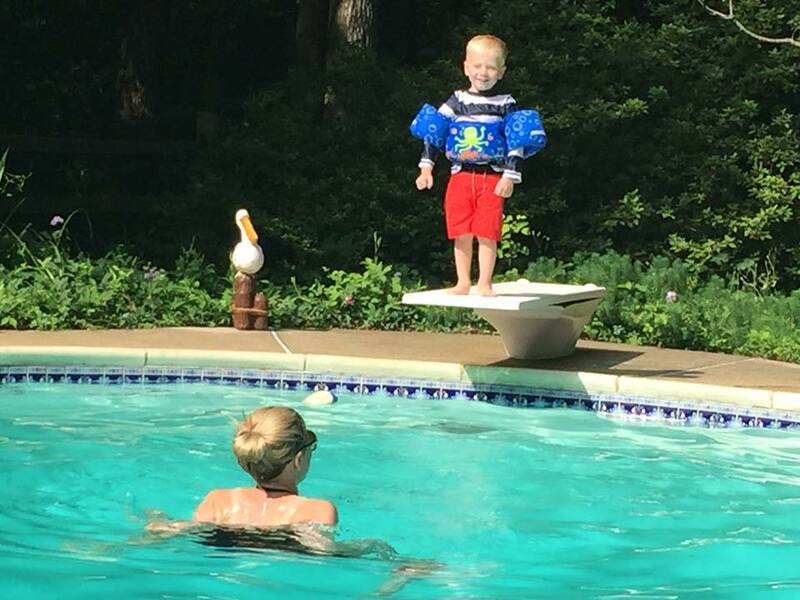 Give that boy a puddle jumper and he's good to go- under water, off diving boards...he'll do it all. And SAND!!! We finally overcame the fear of sand!! 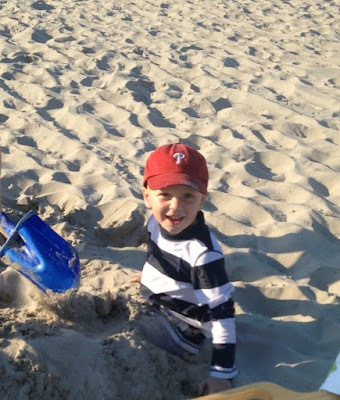 I cherished every second when he was covered in sand and loving it! By the end of the summer he was also obsessed with being in the ocean. After 2 summers of being terrified of the sand I felt I earned every second (at least the 30 full seconds I got) of sitting in a chair and happily watching him frolic around. even family beach photos at sunset couldn't keep him out of the water- linen shirt stood no chance! Until Reid decided he loves (eating) sand too. So much for relaxing and peace. The last week was sand patrol and holding Reid up as he walked everywhere. no time for a pic- let me jump that wave! We had lots of fun having friends and family over for impromptu and planned picnics and splashing in baby pools and running through the sprinkler and slamming a pinata. (and we totally loved having our back yard and deck and felt we definitely made the right choice to move last year) I failed at a homemade margarita recipe and decided frozen mix is the way to go. But I dreamed of s'mores all summer and that dream is still unfulfilled. Hopes for the fall, I guess! We survived our kitchen remodel- that's still not done, but close, one day. like maybe in November our lights will be hung and everything painted. won't hold my breath. Lately I'm purple heart's best customer (donor)- My closet and drawers are practically empty. I'm over my clothes circa 2005, 2010, and even 2012. Time to bid adieu to my first ever pair of "expensive" jeans and my wardrobe from when I lived in NYC (2004). I'm not even kidding. I had a few too many "well you never know when you'll need a plaid school girl skirt, a sparkly dress, a nice practical black blazer." donate. And we all know what that means---time to shop. In the most scrutinizing of ways, of course. And the likelihood of baby haring #3 is pretty much zero since I've sold my Solly wrap. Our bedroom is like a consignment shop and I'm just (still) trying to figure out what to do with everything baby. But the freeing feeling you get from cleaning out- that I love! high five, fist bump, and...publish.